RW: Mike, in the Preface to David Janssen-Our Conversations you give exactly how you and David Janssen met at a party where you were working security and how the two of you created this friendship. What thoughts went through your mind about this, what I might at first glance call an Odd Couple? MIKE: Here was this Mega-TV and film star, the same age as my older brother, and here I was, a “nobody”, not involved in the television or movie business . . . why would a celebrity like him even speak twice to someone like me. I learned later that David Janssen was in reality, just an ordinary, ‘down-to-earth’ guy who happened to be a celebrity, but yearned to have friends outside of his ‘work’ and to be treated as a ‘normal’ guy. RW: When did the actual friendship with David begin? MIKE: Two weeks after our first meeting he called me and invited me for drinks at The Form osa, a nice little restaurant/bar near the studios where “The Fugitive” was being filmed. It was 1:15 AM. That is when I learned a routine day for filming the television series may last 14 to 16 hours or longer. Also, that David Janssen always liked to stop (usually at The Formosa) and have a couple of drinks to unwind before going home. RW: Your second meeting was a call in the middle of the night, a practice that would continue while you were in L.A. David trusted you quickly for a celebrity who valued his privacy. Why do you think it happened like that? MIKE: I honestly can’t answer that, as I never asked Dave. I can only assume it was the fact I was NOT in the TV or film industry, when we met, I did not look at him in awe. We just had, what I would say was, a casual conversation between two guys at a party. I talked to him as if he were just an ordinary guy. He had an interest in police work and dogs, that helped, I think. Dave had no ego to speak of, and he really liked people and wanted to have friends who liked him for the man he was, not for his fame. He soon learned that whatever we discussed, I would not repeat it, it would not show up in some tabloid or fan magazine. Ellie (Dave’s first wife) mentioned that when we first talked about Dave. RW: The after-hours drinks didn’t last forever. Mike, how did your long distance phone call friendship begin with David? MIKE: Soon after meeting Dave, I wanted to leave Los Angeles, and relocate to New York City, as my estranged wife lived in Connecticut. At that time, I had hopes for reconciliation. So a lot was happening in both our lives. That unfolds in Chapter One, and continues throughout the two volumes. RW: Will you give our readers an example of a story they will see in Our Conversations, something that might surprise them? Okay, maybe not surprise because you want to leave those nuggets of wonder in there for them. “It was just after 2:30 in the morning when I pulled into his driveway. It took him a few minutes to open the door. He used the door as a crutch to raise himself out of the seat and steady his feet on the paved driveway. As he leaned in and was saying goodnight, the front door of his home opened and I could see Ellie’s silhouette against the interior lighting. “Having a drink with my friend, Mike.” He said in a soft, firm voice. With that I heard the sound of breaking glass, as David seemed to duck his head; I then noticed a dark red liquid running down my passenger window. Ellie had apparently thrown a glass of red wine and smashed it against my window. As he turned and bent down again to say goodnight. he was smiling. 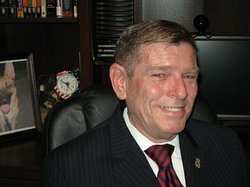 From the car interior lights I saw what appeared to be red wine splashed on his caramel-colored sports jacket and royal blue shirt. RW: Mike, if you would, give us an idea of the depth of your relationship with David, and his family, then and now. I want people to realize how close this friendship was. I mean even family members respected it. MIKE: Aside from Ellie, her daughters Kathy and Diane, the only other member of David’s family I met was his mother Berniece. When Ellie and I were writing her book, we flew Kathy and Diane to Miami and had a very nice dinner at The Jockey Club. Ellie then told Diane she was including Diane’s unwanted pregnancy and subsequent abortion (at age 16) in the book. It hurt Diane deeply, and ruined their visit. Both Kathy and I took Diane’s side and implored, begged Ellie not to include that in her book. Ellie did put it in her book. Her justification being: the secrecy surrounding the trip to Mexico for the abortion, because it would have caused a scandal for David. How she figured that, we’ll never know. I have not seen nor spoken with Diane or Kathy in over twenty years. Diane told me David was planning to divorce Dani a month before his death, which of course he had also told me as well as a few close friends. I can tell you they are both beautiful and talented young ladies. RW: The book you mentioned, the memoir by Ellie Janssen, which you co-authored with her, David Janssen-My Fugitive in 1994 has sold millions of copies. What finally persuaded you after all this time to write about your own personal friendship with David Janssen? MIKE: Since the publishing of DAVID JANSSEN-MY FUGITIVE many, many of David Janssen’s fans and a few of his close friends who knew of the friendship Dave and I shared urged me to write this book. I wrestled with the thoughts that I would be betraying his trust. A few of my close friends, Moises Raudez, one of my Godsons and CAROL CONNORS convinced me I would be doing him a favor, letting his fans see what a really nice, ordinary guy he was and how he was dealing with personal torments, not seen on the screen. 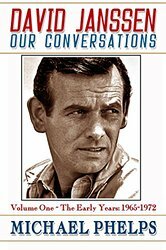 Writing DAVID JANSSEN~Our Conversations was a daunting task and in some ways, cathartic for me. RW: Knowing of the creative process behind My Fugitive I can see how you needed to put out David’s views as he shared them with you. Mike, I have to say as a former history teacher and having had to learn facts to teach each year, I had repetition to help me remember things. But with something like this, how does one recall all those conversations and facts you have in your book? MIKE: In the Preface, I noted that I have written Our Conversations as close to verbatim as is humanly possible. I have not exaggerated nor expounded. In the beginning, I sat down at my computer and closed my eyes; thought back to the first time we met. I visualized the scene, and found I could actually HEAR David’s voice. The conversation flowed easily. I recalled every topic we discussed in that roughly forty minutes talk. I recalled meeting Ellie and her words precisely. Going forward, I found no problem recalling our conversations, whether we were meeting in a bar or restaurant, or the countless long-distance phone calls. I NEVER recorded a single conversation with David, nor did I keep a diary. Initially, I had a problem with the dates and time line. However re-visiting the memories from the beginning, and checking some very old notes, the dates and time fell into place. This was the most difficult because there were periods I did not hear from David for several weeks at a time. RW: It’s fortunate you were involved with the My Fugitive biography some 20 years ago. How did you organize what we see in the books and were there topics that you decided were off limits? MIKE: I began with our second meeting, the first we had at The Formosa and the conversations we had at that time and date came to me. There was a lot going on in his life, most notably discord in his marriage, the grueling schedule of making “The Fugitive”. There were far too many conversations to have included in the two volumes. There were conversations about politics and politicians, Viet Nam, the economy, the Six Day War between Israel and Palestinians that I could have included. I decided to concentrate on our conversations that revolved around his failing marriage, the ups and downs of his career, the women he really loved (and lost), topics I felt would be of real interest to his fans. I included one conversation (which Ellie had also) involving he and John Wayne during the filming of “The Green Berets“, which I felt would interest his fans while showing how Dave always stood up for the ‘underdog’. Other conversations of some of the actors, directors and writers he admired and enjoyed working with. I included very little about his Mother Berniece and other family members. I deliberately left out some conversations we had where he expressed dislike for specific, well known people. RW: Mike, you told me that the memoir with Ellie Janssen “was the most difficult project I have ever been involved with.” would you explain a little about that? MIKE: I never had any doubt that Ellie loved David deeply. She still loved him after their divorce and after his death. She never remarried, and there were no other men in her life. However, early in our working together I could see how bitter she remained over their divorce. As she related her recollections of incidents, other people and friends in their lives, I would recall David having mentioned the same, but with a totally different perspective. Ellie made it sound as if David was promiscuous, a “womanizer” and a ‘drunk’. On one occasion, as I was typing on my keyboard, I stopped and made the comment; “Ellie . . . that isn’t what Dave told me.” she erupted into a rage I had never seen. I knew then what Dave had expressed to me on many occasions . . . her temper! I decided then to just keep my mouth shut and write what she dictated; after all, it was HER story. 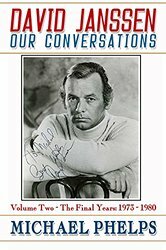 RW: There are a lot of tell-all sensationalist books out there about ‘friendships’ with celebrities but there is nothing of that feel in David Janssen-Our Conversations. But with names appearing I imagine some people might have been a little apprehensive when word got out you finally gave in and were writing. Did you feel a need to let any certain persons know ahead of time what you were going to write? MIKE: The only person who knew David intimately, that I have discussed the book with is Carol Connors. Funny thing was, when I told her that David truly loved her and using his exact words, she broke into tears and said that Sidney Korshak (a close friend of Dave’s) had told her exactly the same thing. RW: Mike, what has been a couple of reactions to the book so far? MIKE: Since the release one gentleman stated; “The book is all about booze, women, lawyers and dogs.” Well, I don’t know what he was expecting . . . but, during the fifteen years I knew David Janssen that is what took up the space in HIS world, as well as HIS work, which the gentleman failed to mention. Just today, I had a telephone call from Mr. LES LANNOM, who guest starred on “HARRY O“ episodes. We have had many conversations, but today he called to tell me had finished reading the books; and I quote: “Mike, you really caught the way David spoke . . . the way he treated people.” David liked Les Lannom; liked working with him, liked him as a friend. Les, who is about my age, looked upon David as a friend and a mentor. RW: Were there any push backs from people when they heard you were writing Our Conversations? If so, how did you handle those? You seem very professional so I can’t see people really concerned with what you would say. MIKE: There were only a few people who knew I was working on this project. Aside from Carol Connors, just Moises Raudez and a few devoted fans of David’s that I met through “THE-FUGITIVE-VIEWS-AND-REVIEWS” on Yahoo Groups. There are a few that I mention in the Dedication page who were very supportive of me and inspiring me as I worked. It has been a four and one half years journey into the past with my friend, and I hope I did it right. I encountered a few health issues along the way, so my writing was interrupted a couple of times. RW: Our Conversations have kept me glued while reading. The information you share, the writing, the flat out honesty. I’m not saying this so our readers will go buy the book. I know readers will buy what they want to, but I have to say this: these would be one great holiday gift for a TV/film buff. Have you given thought to writing a movie script based on them? MIKE: No, I have not even considered this would make a good movie . . . maybe it would, I don’t know. I will say that I believe a movie, perhaps a Made-for-Television Movie about David Janssen’s LIFE would be excellent, and is long overdue. I’ve seen some Biography movies of celebrities on the A & E channel, and most are of celebrities of far lesser importance as to the individual’s contributions to the entertainment industry. RW: Mike, you knew him probably as well as any living person, the inside of him, who would you pick to play David Janssen in that movie? MIKE: Were such a prospect of a film based on David’s life come to be, were I to have anything to say about it, JON HAMM (“Mad Men” fame) would be the only actor I feel could BE David Janssen. DAVID JANSSEN had a charisma, a magnetic personality that just drew people to him. He was so dedicated to his craft, and it was so important that he performed every single line or every single scene to PERFECTION! David had an amazing photographic memory. He could and did MEMORIZE an entire one hundred + page script, not only his lines, but the dialogue of every single actor involved. He was not seeking entertainment industry awards, he was just determined to provide his fans with the best he could do, to make certain they were “getting their monies worth.” There are many Hollywood Stars who have long ago passed away, yet they made such an impact on their fans, they will forever be remembered. David is at the top of the list. To say today has been one of the best for this fan is an understatement. ‘Mike’ is author Michael Phelps, who happened to have been friends with a TV Icon. There is more to Michael Phelps than what you’ve seen so far and more about his friendship with ‘Dave’ as well. Click here for part two of the interview. You won’t be disappointed. But go ahead and grab his books now. You can connect with Mike on Twitter @MichaelPhelps3. Acquire his books either on his Author site here or on Amazon here. Read My LWI review of Volume 1 by clicking here. For my Amazon version click here. *A note about Carol Connors-You might know her from the song To Know Him is to Love Him when she was lead singer of the Teddy Bears. She also co-wrote the ROCKY theme song. Yeah, the boxer not the flying squirrel. Excerpt from my Interview with author, Michael Phelps. On Monday I will be sharing my interview with Michael Phelps. Author and very good friend of the late David Janssen, star of the TV series The Fugitive and others. Michael had a friendship with David Janssen unlike others. It’s not a tell-all book. I have it. I’m reading it. I am loving it. I wanted to share a short piece of that interview today. He shared so much that it may even be a two day event. The man is open and can make you feel at home telling you about a beloved actor and how he put David Janssen: Our Conversations together. RW: How does one recall all of those memories you have in your book? background of how Dave and I met, how our friendship developed over time. here I was, a “nobody”, not involved in the television or movie business . friends outside of his ‘work’ and to be treated as a ‘normal’ guy. verbatim as is humanly possible. I have not exaggerated nor expounded. recorded a single conversation with David, nor did I keep a diary. Initially, I had a problem with the dates and time line. notes, the dates and time fell into place. This was the most difficult because there were periods I did not hear from David for several weeks at a time. RW: Was there a lot of outlining, gathering of information and the like? For example, did you remember and write in order or did things come and you then had to determine where they fell in the time line? drinks to unwind before going home. There is a lot more to come on Dec. 15 & 16 on LitWorldInterviews. I don’t share those interviews that much here, but I will those.